What is the “Tier system” and how does it work? Home > Blog > PV talk > What is the “Tier system” and how does it work? ReneSola Ltd are a leading brand and technology provider of solar photovoltaic ("PV") products to our company. The company recently announced at the InterSolar North America solar exhibition and conference that the Company has been upgraded to "Tier 1" status on the prestigious Bloomberg New Energy Finance ("BNEF") PV Module Maker Tiering System. What is the Tier system & how does the Tier system work? There is a pyramid system designed & provided by Pike Research below, which lays out thier version of how the ranking system works. According to Pike research, the Tier 1 manufacturers make up a very minimal percentage (approx 2%) of the total number of manufacturers on the market. There are a number of very distinctive characteristics that set them apart from the other tiers in the pyramid. One of those differences, is that they are vertically integrated. This means the company manufactures their panels from scratch. They do not use other companies products and parts to manufacture their panels. The company controls the entire production process from begining to the end, resulting in a high quality finished product. Majority of the Tier 1 installers will heavily invest in the Research & Development for their products and are always looking for the latest technology & design features to ensure their product is top of the line and innovative. Tier 1 installers use automated manufacturing techniques that ensure the highest level of quality whilst also being cost effective to the company. 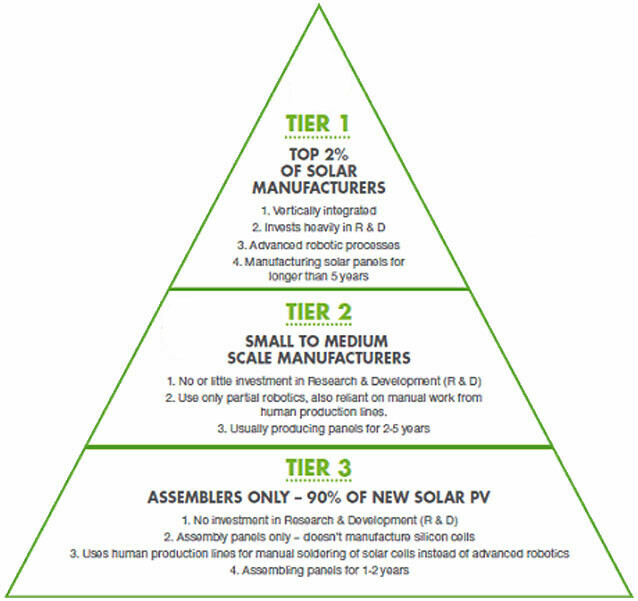 In order to be eligible for "Tier 1 Status" for Pike Research the company must have at least 5 years in the industry of producing solar panels. The manufacturers which are ranked as Tier 2 make up around 8% of the market. Having been producing panels for longer than Tier 3 manufacturers (approx2-5 years), their investment into the R&D side of their business is relatively minimal compared to Tier 1 manufacturers. Not all choose to use robotic automation either. Tier 3 manufacturers make up the bulk of the market approx a 90% share, according to Pike Research, however they have the least experience in the industry. They will assemble their panels by using components manufactured by other companies, because they have no R&D set up of their own. Also their production processes are reliant on manual labour. Due to solar panel manufacturers around the world facing hard times, due to a large drop in sales, it is almost forseable that many of these companies may not be around in the next few years due to industry consolidation. This entry was posted in PV talk on February 10, 2014 by rudy.